I ran into an old ex-friend. She has gained weight. Im my mind I thought “OMG she has gotten big”. But who am I to think that. I was just there 7 months ago. How dare I judge her? I guess the guilty part was because in my mind I looked down at her when I should have related to her. Okay let me let you in on the story of our no longer existent friendship. She was a one-sided type of friend. You know the kind of friend that wants you to follow them around, attend their events, go where they want to go but dont want to do anything of the things you suggest. Yeah she was that kind of friend. I expressed it to her once and she countinued to be that kind of friend. So I no longer called , texted or visited. A year later we both applied for a promotion. (Oh yeah we work for thrle same company different location) saw her name on the interview list and I am sure she saw mine. WTF.. if that was her way to spark a convo she should have dropped the I really don’t care part. I didnt respond to the text. First off if you were a real friend it wouldn’t take a year and a half to reach out to me only because you saw my name on a promotion email. 2nd you do know why we are no longer friends because I told you but the thing about one sided people they can’t hear anyones voice but their own. Yesterday she saw me first. My guy said “do you know her she keeps looking your way”. Then I looked saw her, she waved and I waved and that was it but I felt guilty because the first thing I noticed was her weight. I dont want to judge anyone. I want to help others. I am not superior to anyone. I know the weight gain struggle. If you see an old friend or enemy and they gained weight how do you feel or what are your thoughts? the thing with not seeing a person for a while is that when we next see them, we notice what ever is the biggest difference from the last time we saw them (that sentence goat away from me a bit I hope it made sense). Would you be worried about judging her if she had lost weight? I guess you only noticed it because it ws the biggest change, If she had gone from brunette to blonde or some such thing and that was the biggest change, I bet that would be what you noticed first. When I say her it was the 1st thing I noticed. I just felt wrong that I noticed that why couldn’t I notice anything else. 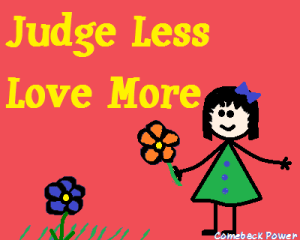 Especially since i’m in weight loss mode I am trying NOT to judge others because I don’t know their personal struggle. I was attempting to say that I don’t think you were being judgmental!